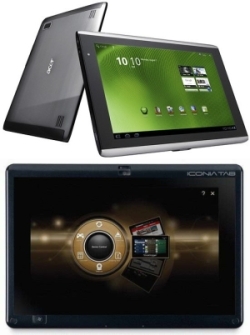 Acer India has introduced new tablets in the market- Acer ICONIA TAB A500 and the Acer ICONIA TAB W500. The A500 runs on an Android platform while the W500 runs on Windows 7 thus catering to the needs of both segments of buyers. During the launch W S Mukund, Managing Director Acer India said "Innovation is part of our DNA. With the launch of the ICONIA range of tablets in India, we believe this technology will change the dynamics of consuming digital content. Indian market is not too far behind when it comes to adopting new technologies, with the growing demand for the tablets in India we expect tablets to significantly contribute to our overall revenue in the calendar year 2011." Here's an in-depth look at the tablets. The Acer ICONIA TAB A500 is just 13.3mm thick and is light weight. It runs on the Android 3.0 Honeycomb Operating system (specially designed for tablets) with Acer's simplified user interface and has an 10.1 inch high resolution capacitive multi-touch display. It has a dual-core NVIDIA Tegraâ„¢ 2 CPU inside and has HD-optimized graphics from the ultra low power NVIDIA GeForce GPU with Flash 10.2 support. The A500 has an ultra-sensitive gyro meter that will enhance the gaming experience and has preloaded HD games inside and complex online 3D games with an option of going to the online store for more games. Acer has also added a new applications like SocialJogger that shows live updates from multiple social networking sites on a single screen for better social connectivity, MyJournal for better management and collection of web information and ScrapBook for storing clips and posts. Unlike A500 which is an Android device, the Acer ICONIA Tab W500 has Windows 7 Operating System. It is a hybrid design that can be used both as a portable tablet and as a standard notebook, it has touch screen cacapabilities and has full-size dockable chiclet keyboard. The tablet weighs less than a kilogram and has an 10.1 inch WXGA screen, which supports image auto rotation. It has a dual-core AMD processor with integrated graphics and Dolby Advanced Audio v2 audio enhancement for better sound. Acer has also introduced the Acer Ring that puts a selection of applications and utilities chosen by the user at their fingertips. All you have to do is place your five fingers on the ring to mke a circle and ring gets activated. The user can then scroll through and select any of the applications available and also use other functions like the camera and the internet from the Acer RIng itself. Both the tablets have SIM Card spport, a USB and a mini USB port and have an HDMI output and MIcroSD card Slot. They also have optional 3G for faster connectivity and browsing speeds. Another cool feature is the Clear.fi media sharing system with the help of which you can share content between the gadgets. This will be a preloaded feature in the devices. "We have created a new range of easy to use devices with touch technology which includes smartphones, notebooks and tablets on their latest Windows 7 and Android operating system. Today consumers want to have a complete control over their content creation and our touch technology will completely remap the user experience to create a far more natural interaction with their devices. Tablets, the new age device have paved the way for users to enjoy a whole new form factor enabling them to stay connected for both business and entertainment purpose. We're pleased to announce the launch of Acer's ICONIA tablets that offer impeccable touch experience," said Mr. S Rajendran, Chief Marketing Officer, Acer India. Apart from the ICONIA tablets, Acer also launched the ICONIA Smart A300 smartphone which is an 4.8 inch screen and has an 8 mega pixels camera and runs on Android Gingerbread 2.3 operating system. ICONIA A100 which is a 7 inch tablet device making it much more portable and a Dual screen touchbook with full touch interface. According to pluggd.in the Acer ICONIA TAB A500 will cost Rs. 27,900 in the market and the Windows 7 tablet Acer ICONIA W500 will be priced at Rs. 32, 499 and with the iPad 2 now available in the Indian market at a price range starting from Rs. 29,500 the Acer tablets will face stiff competition from them.